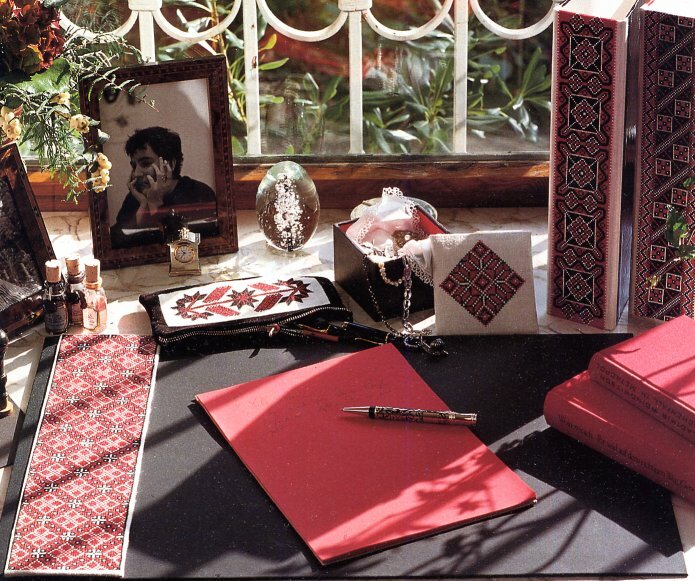 Today i am going to do a very general overview of ethnic Russian Embroidery. There have been many publications and exhibitions showing embroidery from the Russian Empire, or the Soviet Union, or from Russia, which include much that is not Russian. I have seen Uzbek, or Chuvash, or Armenian or Nanai, or Ukrainian embroidery blithely listed as 'Russian' by those who couldn't be bothered to investigate properly. The Russian Empire, and later the Soviet Union, of course included many non-Russian nations, and even today the Russian Federation contains millions of people who belong to various indigenous peoples. Ukrainians are very familiar with this, and it seems we are constantly having to tell people, NO, we are not Russian. One case in point, a german music company Laser Light, has put out an album using one of my grandfather's paintings for the cover. The painting showed a Strilets', one of the elite troops which fought under Austria, and later for Ukrainian independance around WWI, playing a guitar to a girl. The album they put it on was named 'Russian Folk Songs of the Urals'! That would be like putting a painting of Don Quixote on the cover of an album called 'French Paladin Songs of the Alps'. Another example, here is a very good book of Ukrainian cross stitch designs. 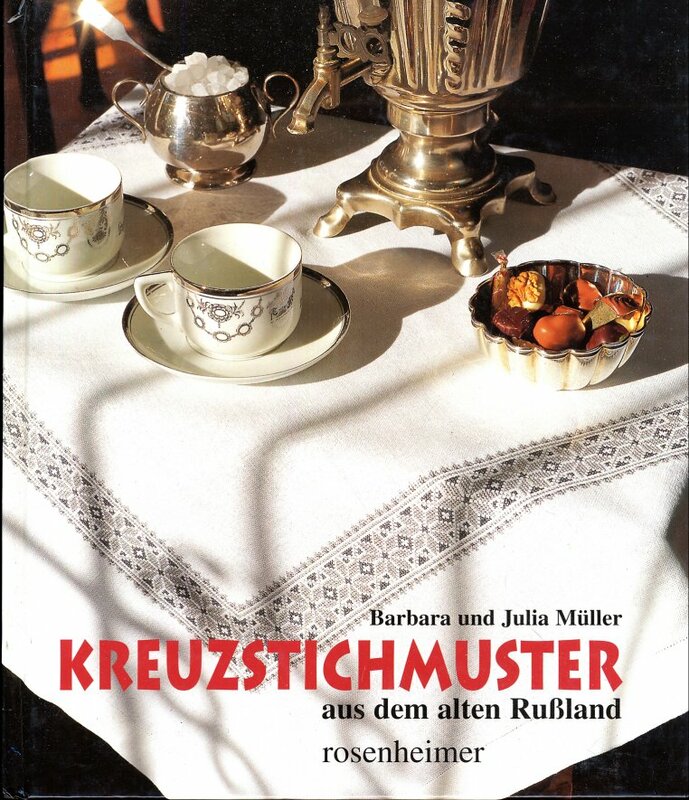 The problem is that the german authors titled the book 'Cross Stitch pattens from Old Russia'. I suppose considering all of the old Russian Empire to be Russian, which hopefully we all know is not the case. Here is a photograph from the book showing some of the finished designs on projects that are included. The designs are very familiar to anyone who has done Ukrainian embroidery. I grew up seeing designs like this all over. 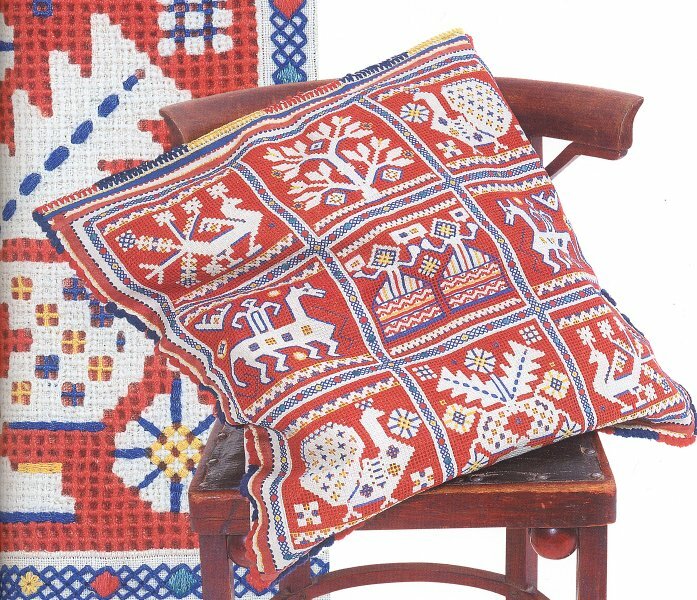 The telling point is, i have read several books on Russian Embroidery, and they do not claim these types of designs. Having gotten that out of my system, I will devote the rest of this posting to embroideries of the Russian People. 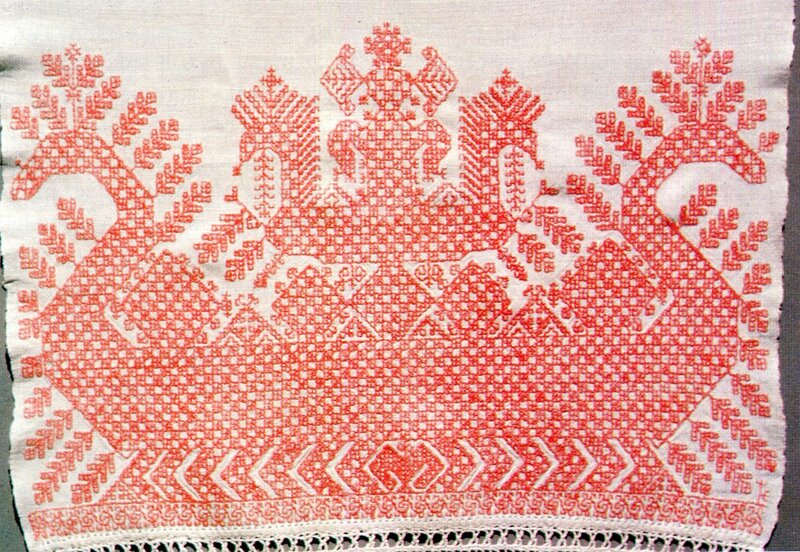 Russia, like Poland does not have a ubiquitous culture of embroidery, but does have several well developed and expressive local embroidery styles. Today i will give a small taste of several of them. I will not be including Church or Court embroidery styles, that is rather out of my sphere. First, the gold embroidery done on headresses and outer clothing in northern and central Russia. Here is a detail of a woman's jacket. This was worn with the typically North Russian Sarafan costume, which grew out of the Boyar tradition of the aristocracy before they adopted western styles. This was widely copied by lower class Russians who could afford to, especially in the Northwest. 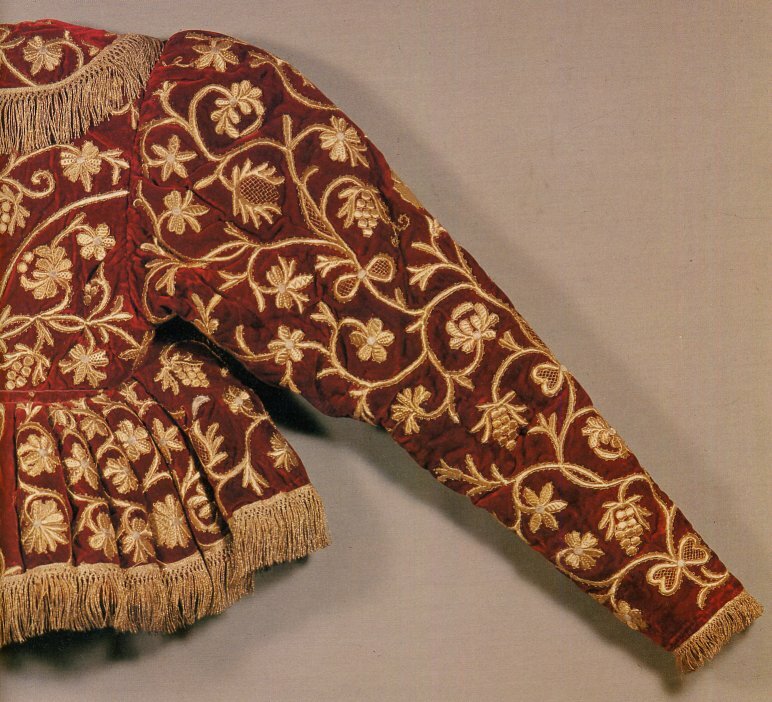 Another style of embroidery is that which the Russians refer to as 'painting', essentially designs built of backstitch or Holbein stitch, most typically entirely in red. This is an example of a local development of a technique which is extremely widespread over Europe and Asia. This is found in Central Russia, but is most typical of the Northwest, and is also found among the Veps and Karelians. Here is a design which Russian historians call 'the Sun Chariot'. There has been much written about the mystical significance of designs like this, but you will have to research that elsewhere. 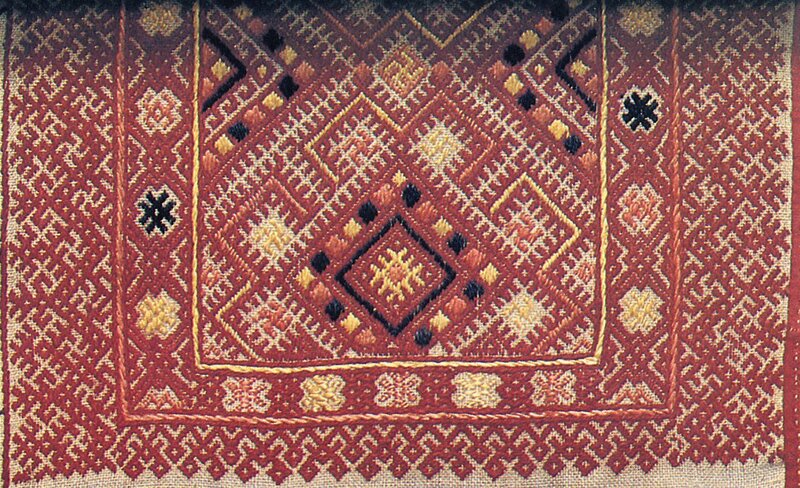 Another type of embroidery of the northwest, especially Olonets' province is this type of darning stitch embroidery, bearing some resemblance to Hutsul work. I do not think that this is any evidence of a genetic connection, but rather of the survival of a very old technique in different places. You will notice a preponderance of red in these embroideries. The Russians have a proverbial love of the color red. This goes back many centuries, to the point where the word for red has been lost in the Russian language. The slavic word for red is 'cherviony', but in Russian they use the word 'krasny', which actually means 'beautiful'. This has taken such deep root in the Russian language that they had to invent a new word, 'krasyvy' to be used for 'beautiful'. By the way, I am covering the folk arr of the Russian homeland, which lies north of Ukraine and Belarus, and west of the Volga, The Russians have of course spread far to the east since the time of the decline of the Golden Horde, but the bulk of the development of the folk culture took place in the Russian Heartland. Here is an example of Russian cross-stitch embroidery from the northeast province of Vologda. 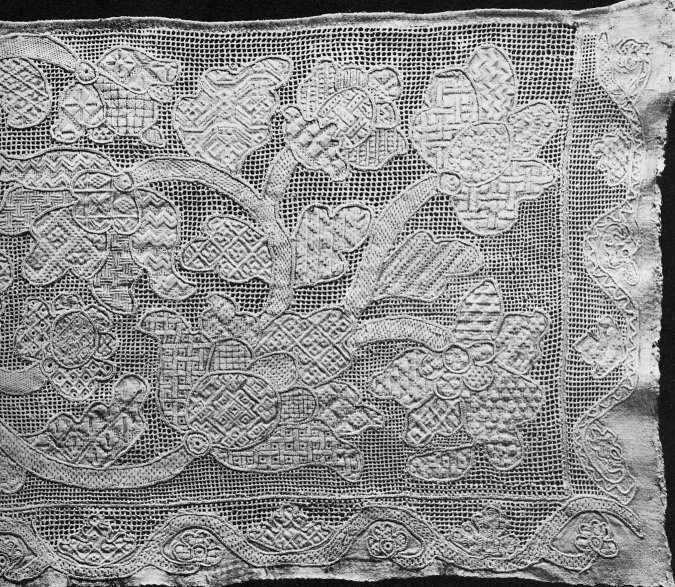 This photo is in black and white, but the embroidery is all in red. There is often some admixture of other colors, as in this example from Kargopol. Chain stitch or tambour embroidery was introduced into Russia at some point, and became very popular in some areas. 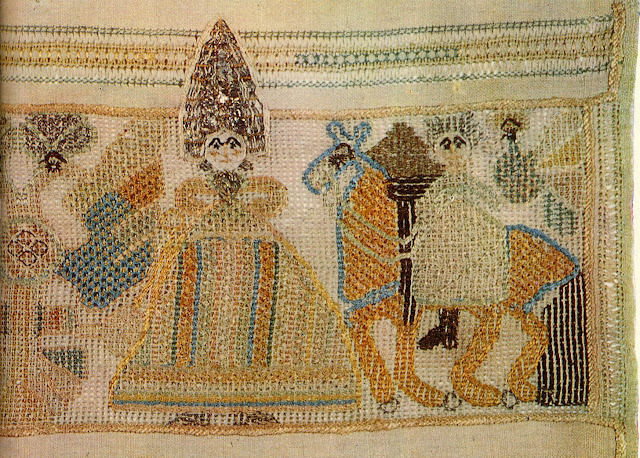 It was often done on a colored backgraound of factory cloth, as it is not a counted thread technique, as so many of these are. Below is an example from Olonets Province. Reticello became popular in the north, I believe as an import from the west, but I do not have data to support that. This is an example from Novgorod Province. Certainly many of the designs on this kind of work seem to be of the court. There were many pieces like this made in the north, done on premade netting, as in western Europe. This was possibly the inspiration for four different local styles of embroidery in Russia. The first one starts by outlining the design in blanket or chain stitch. Then the backgroun is worked, two threads left and two threads drawn, as in hemstitching, except that this was done in both directions. these threads were then wrapped singly by thread, holding them in place to form a sort of netting. 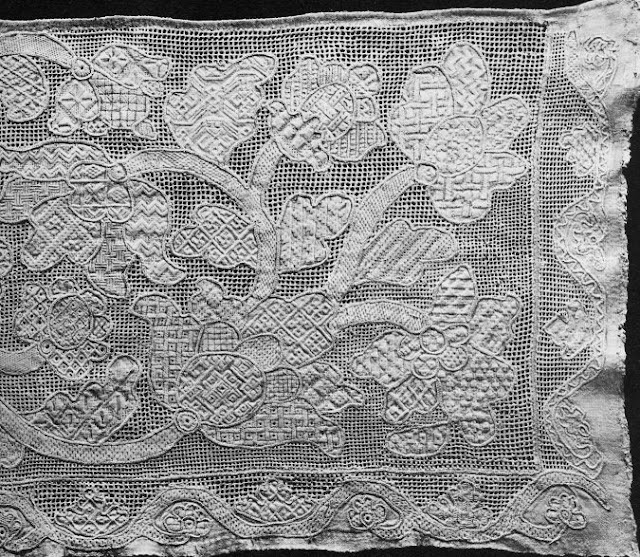 the inside of the motifs were then worked with 'blackwork' stitches, only in white. Here is an exuberant example from Arkhangelsk. The next phase was to draw threads from the entire area to be worked. Other threads then woven back in to the netting to form the design. This example is typical of the subtle colors used in the Yaroslavl style. 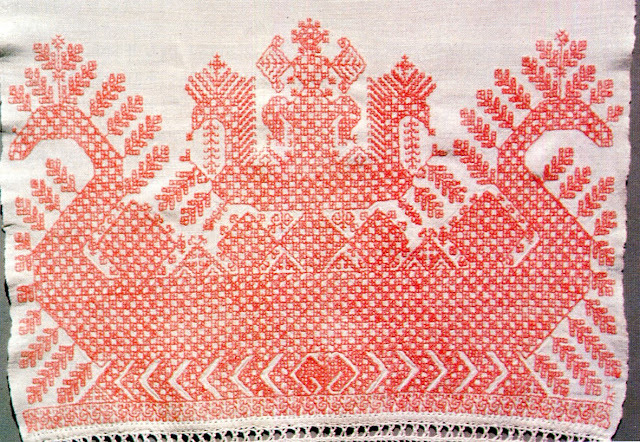 In Tver' Province, after the cloth was drawn and the 'netting' bound, the motif was rewoven in white, either vertically and horizontally to basically reweave the cloth to its original opacity, or diagonally, so as to create a distinctive waffle texture. Then they were outlined in bright colors, which were also often used on the netting to create designs. Here is an example showing both types of reweaving. 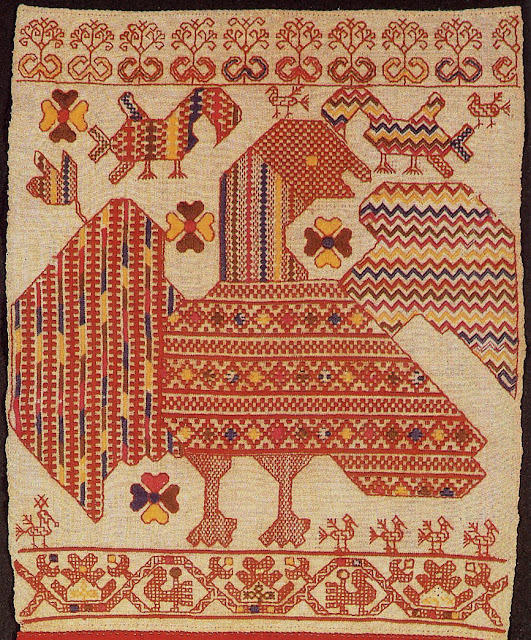 Here is another piece showing the use of colors embroidered over the 'netting' and also showing some of the motifs rewoven in red instead of white. 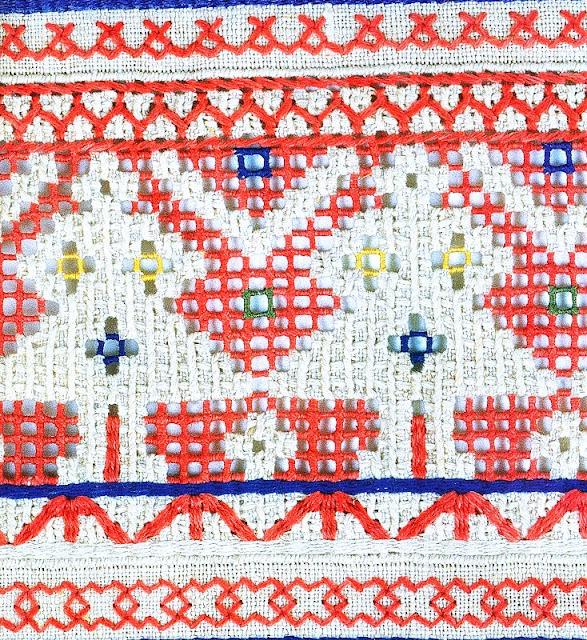 In Kaluga Province, instead of taking just one turn around each bar of the netting to hold it in place, they instead wrap it completely in colored thread, a technique also found among the Chuvash. Unlike the Chuvash, they then reweave the central motif in white, as they do in Tver' Province. The end effect is of a white image against a colored background. 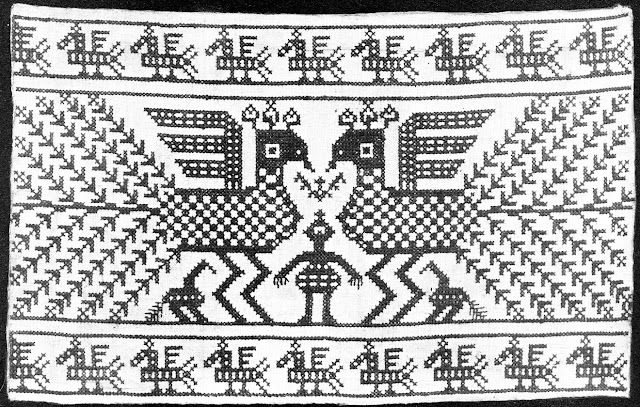 This has to be one of the most unique and impressive styles of embroidery found among the Russian People. 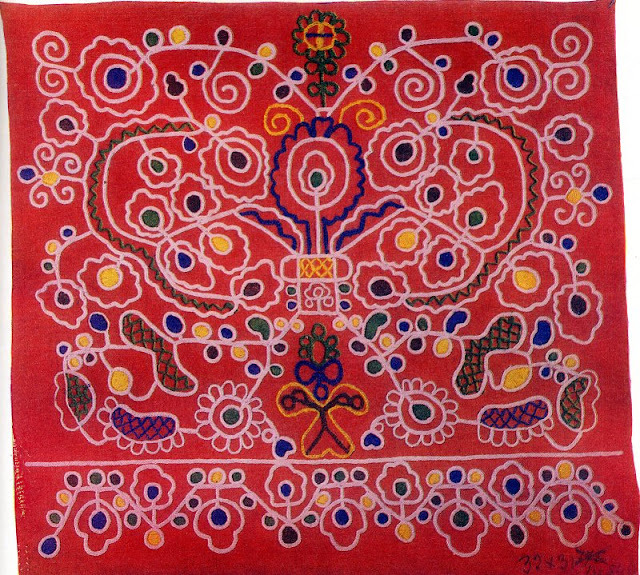 The typical color palette is red white yellow and blue, with some green added at times, Here is one fine example from the work of M. N. Gumilevskaya, a renowned artist who developed this folk technique to a great degree. 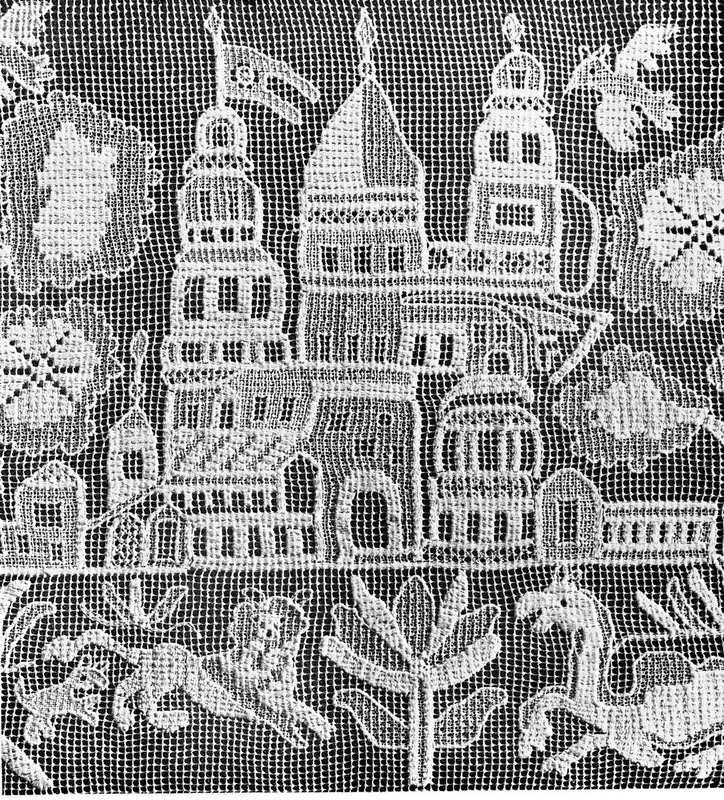 In the background is a closeup of one of the motifs on the pillow. Here is an even closer view of another piece, showing details of the work. This style of embroidery in Russian is called 'perevity'. And that is it for today's posting. 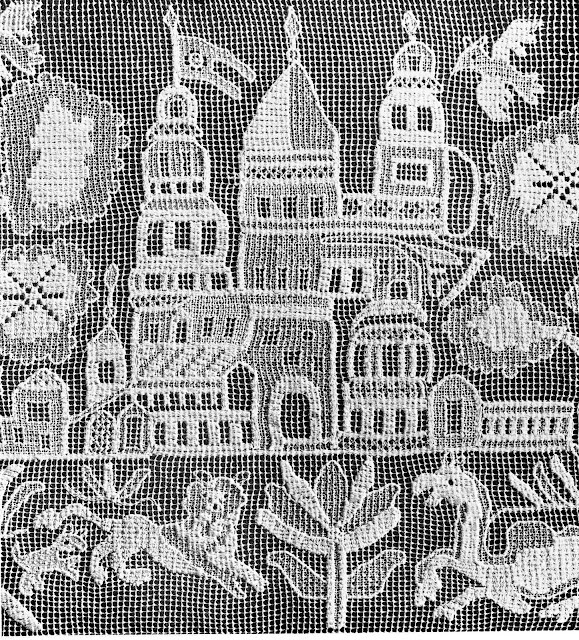 This is not an exhaustive survey of Russian embroidery, but I hope it is a good overview of many of the styles developed by the Russian people. I hope this inspires you. I will do a more in depth coverage of at least some of these styles in the future. Here are a couple of good links on this subject. This site concentrates on verifiable peasant costumes and some of the embroidery techniques which i have covered today, including the mystical meanings of some of the traditional motifs. Make of that what you will, but it is a good resource. And here you can buy Russian shirts for men and women and other items. Thank you for reading, go and be creative, and tell others about this art form. Do you know my website? Is there, among all these patterns, one which could be especially o exclusively "russian", with no connection to ukrainian or Finnic motivs ? Is there a Sicilian Folk Costume?